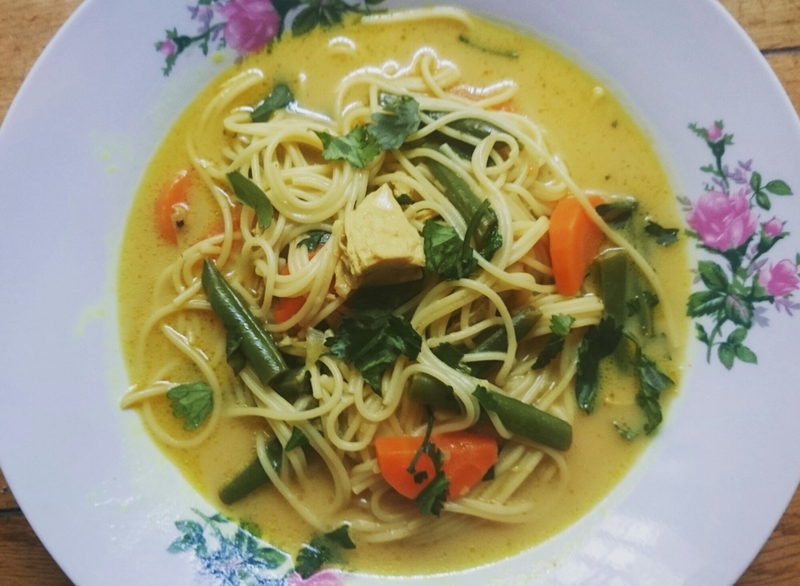 Thai-inspired Chicken Noodle Soup | cook on your nerve. All soups are meant to heal, but this one’s for my sister-in-law who has saved me one tiny bowl each time I’ve made big pots of it. I’d receive a text from her while at work that’d say, “Sorry. Don’t hate me.” She had a sore throat all week long and this was the only thing that was soothing to her. How could I be mad? When I was not feeling myself for a good week, she was the one who made us dinner each night. I sent her a text giving her all my thanks and told her I’d get right back in the kitchen very soon. Jen and I are spice maniacs. She introduced me to Valentina hot sauce and I now put that on (almost) everything. That is, when I’m not using sriracha, which this soup has plenty of. There’s heat, acidity from limes (which may be her favorite thing about this soup) and a silky broth of chicken stock and coconut milk which just happens to be the perfect recipe for curing any cold. Don’t forget the ginger! I first came across this recipe from Brooklyn Homemaker and made some changes according to Jen, and according to what I had around/in stores. String beans because her mother once made us Mole de Olla, a red soup that I fell head-over-heels in love with–it had ears of corn, whole string beans, and oxtail. It’s red heat had superpowers. I have every intention of standing right by that woman’s side the next time she makes it so I can take some notes. I’ve also added fresh turmeric for it’s golden color and also because it’s my favorite thing ever these days. Use powder if you have that instead. I usually salt my chicken the night before but day of is fine as well. Lightly sear the chicken about 3-4 minutes on both sides then set aside. Saute your garlic, ginger, and onion with the turmeric. A minute later, add your carrots, stirring everything together. Pour your stock over everything and let it simmer for about 20 minutes. Remove chicken and wait about 5-8 minutes before dicing or shredding them. Add coconut milk, sriracha, lime juice into the pot. Taste often at this point til the flavors and heat are just right for you. Add your string beans and pasta about 10 minutes before you turn your pot off. (Or add your noodles separately.) Stir in the chicken. When your soup is done, light it up with all the green garnishes you want. When I FIRST tested out this soup, it was during a visit from Jess. She gave me a hand with it and I ended up throwing in a leftover baked potato from the night before. I also like to add oregano. Sometimes jalapenos. Play around with this recipe because even a leftover potato tastes amazing in it. Big thanks to Brooklyn Homemaker for the inspiration. His Loaded Mac-n-Cheese is also a favorite of Jens! Jen is sick again! So here’s to making another pot of this soothing, spicy soup. And look, it got a photo upgrade. Next PostJoin Me for Queens Writes Weekend!